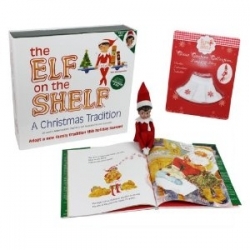 The Elf on the Shelf Gift Set is a cute rhyming storybook with an accompanying Santa's elf. There are both boy and girl elf dolls available. Each special elf works as a scout for Santa Claus, and every night he/she returns to the North Pole to report on who's been naughty and who's been nice. When the kids wake up, the elf is hiding in a new place each morning. It can be the start of a fun Christmas elf tradition for young and old alike. Read more below, or pick from one of the other elf toys shown here and start your own family elf tradition. Whether you already love Elf on the Shelf or are just getting started, the new "Elf on the Shelf: An Elf's Story" DVD will be a great holiday movie to own, as it tells the tale of one of Santa's scout elves and his adventures helping a boy named Taylor rediscover his faith in Christmas magic. Product description: This Elf on the Shelf Gift Set includes The all-new Elf on the Shelf, An Elf's Story Movie on DVD and the adorable 3" Ceramic Elf on the Shelf figurine with the velvet pouch (and a Bonus Make-Your-Own Elf Ornament Craft). An Elf's Story Movie tells the story of Nine-year-old Taylor McTuttle who has reached a crossroads. Does he believe Santa Claus really knows who is naughty or nice? Does he even believe in Santa Claus anymore? An Elf's Story is the inspirational tale of Chippey, the young scout elf who is assigned by Santa to restore Taylor's belief in Christmas magic. When the boy breaks the number one Elf on the Shelf rule, Chippey loses his Christmas magic; the entire McTuttle family loses its scout elf, and both Taylor and Chippey lose their self-respect. Through the power of love and forgiveness, both of them learn that true belief cannot be taught. Destined to be a beloved family Christmas classic, An Elf's Story is filled with fun, music and the timeless message that Christmas is something we carry in our hearts. My kids love this cute book and stuffed elf set. The only problem is that I need to remember to move the elf each night - and remember where I put him! One night our elf got lost at the North Pole and was missing for an entire day. I hid him at night and then we left early the next day for an all-day family gathering. So nobody looked for him in the morning. The morning AFTER the family gathering, our elf was nowhere to be found. He remained MIA for several hours until I remembered where I had hidden him. So a word of caution to parents - don't let you elf get too good at hiding! How does Santa really know who is naughty or nice? The answer is finally revealed in...The Elf on the Shelf A Christmas Tradition.TM The Elf on the Shelf A Christmas Tradition is an activity the entire family will enjoy. Based on the tradition Carol Aebersold began with her family in the 1970s, this cleverly rhymed children's book explains that Santa knows who is naughty and/or nice because he sends a scout elf to every home. During the holiday season, the elf watches children by day and reports to Santa each night. When children awake, the elf has returned from the North Pole and can be found hiding in a different location. This activity allows The Elf on the Shelf to become a delightful hide-and-seek game. The Elf on the Shelf gift set includes a scout elf from the North Pole, a hardbound children's book and a keepsake box for easy storage. Baby Elf on the Shelf - Perfect for the youngest kids in the family! If you've got a little one in your house, the Baby Elf on the Shelf is the perfect elf to share the elf tradition with your child. The Christmas shelf elf that comes in the Elf on the Shelf gift set is smaller and not as cute as the larger stuffed versions. My kids prefer the larger plush version. If you already own the book and don't need the complete Elf on the Shelf Gift Set, or simply prefer a larger, stuffed version of the character, this stuffed elf can perform the duties of the scout elf and report back to Santa. This stuffed elf doll is a darker-skinned version of the character from The Elf on the Shelf. Also available in 19" doll. This 30-second promo for the Elf on the Shelf gift set shows how Santa's elves return to the North Pole to report on who's been naughty and who's been nice. Like Elf on the Shelf, this story is about one of Santa's elves who watches over children to be sure they're behaving. This story was originally published back in 1985, so Christopher Pop-in Kins might be credited with starting the Christmas elf tradition. Long before Elf on the Shelf came around, Hermey was helping Santa at the North Pole. Hermey the Misfit Elf may be one of Santa's best-known (former) elves. He and Rudolph the Red-Nosed Reindeer ran off together because the other elves and reindeer made fun of them, but when they returned, Hermey was able to achieve his dream of becoming a dentist. This poseable action figure of Hermey the Elf comes with working pliers, and his own dentistry book. If you've already told your kids about the work of Santa's helper elves, you can bypass the gift books and grab an elf. These "secret" elves come in both male and female versions. Santa's has a wide variety of elves, and here's another one. This cute stuffed elf is straight from the North Pole. Bring him home to start reporting back to the North Pole. Fiesta Toys Plush Santa's Secret Elf Girl 11"
Santa's most famous elves, such as Hermey and the Elf on the Shelf, may be boys, but Santa, of course, is an equal opportunity employer who also has female elves. This stuffed elf toy is proof! Elf Pet Costume - Could he pass as one of Santa's secret elves? Don't let Fido miss out on the fun. Here are some cute elf dog costumes for the holidays! Product description: Christmas is for family and our pets. Dress your pet in this elf costume which includes hat, tunic and cuffs. If your elf has been doing his job, he has been reporting back to Santa Claus every night to let St. Nick know about all your child's good accomplishments this year. So make sure Santa sends a letter to your child and lets him or her know how proud Santa is. One site that makes it easy to create your own Santa letters at home include Printable Santa Letters.com, or you may prefer the elf letter at Free Santa Letters Online.com. Or for a full-service site that lets you choose one of dozens of letters or write your own text, try Santa's Official North Pole Mail. What's it like to be an elf at the North Pole? This movie won't explain the Elf on the Shelf tradition, but it's a lot of fun. If you haven't seen it, go rent it, buy it or borrow it from your neighbor. It's great for the whole family. Amazon review: Elf is genuinely good. Not just Saturday Night Live-movie good, when the movie has some funny bits but is basically an insult to humanity; Elf is a smartly written, skillfully directed, and deftly acted story of a human being adopted by Christmas elves who returns to the human world to find his father. And because the writing, directing, and acting are all genuinely good, Elf is also genuinely funny. Will Ferrell, as Buddy the adopted elf, is hysterically sincere. James Caan, as his rediscovered father, executes his surly dumbfoundedness with perfect aplomb. Zooey Deschanel, as a department store worker with whom Buddy falls in love, is adorably sardonic. Director Jon Favreau (Swingers) shepherds the movie through all the obligatory Christmas cliches and focuses on material that's sometimes subtle and consistently surprising. Frankly, Elf feels miraculous. Also featuring Mary Steenburgen, Bob Newhart, Peter Dinklage, and Ed Asner as Santa Claus. Do Your Kids Have the Elf on the Shelf Gift Set?